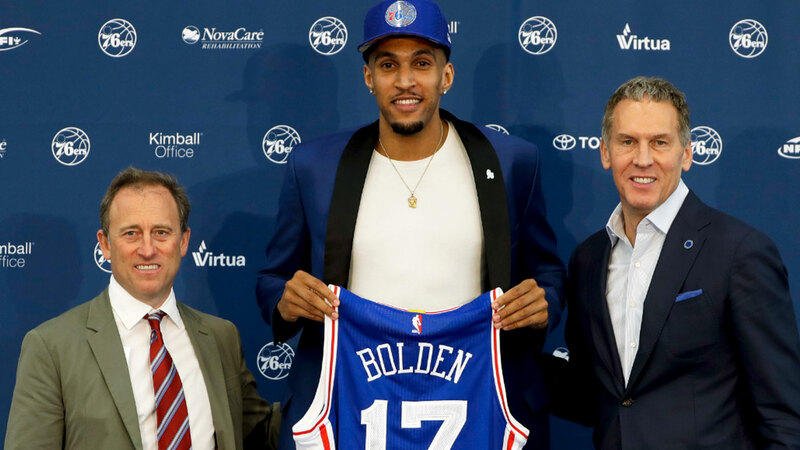 Australian 76ers rookie Jonah Bolden is riding a path to make a serious mark on the NBA, according to one of basketball’s most renowned trainers. Jordan Lawley works with some of the best basketball players in the world. When guys like Kevin Durant, Klay Thompson and Carmelo Anthony want to take their game to the next level, they train with Lawley, and among his impressive stable of clients, is Bolden. Speaking to Wide World of Sports while in Sydney for junior clinics led by Kings star Jerome Randle, Lawley gushed about how impressed he’s been with Bolden’s rise in the NBA. "He’s hungry," Lawley said of Bolden, son of 1992 NBL champion Bruce. "To make it to the NBA and then stick in the NBA you have to fit in the NBA, and for him, being a three-and-D guy, understanding that if he can affect the game on the defensive end by continuing to get the rebounds and blocks - he’s amazing at the basket - if he can continue that, he’s going to have a role, he’s going to be able to stick and have a big impact in the league." Bolden was drafted as the 36th pick in the 2017 NBA Draft, but Philadelphia stashed the 6-foot-4 power forward, and the Melbourne-born, Sydney-raised product turned to Maccabi Tel-Aviv in Israel to continue his development. This season Bolden has finally been able to showcase what he can do with the 76ers in the biggest and best league in the world. On the same day Wide World of Sports interviewed Lawley, Bolden dropped a career-high 14 points in 16 minutes on court, making 4/5 three-pointers, four rebounds, one assist and two blocks - a result which drew an impassioned fist pump from Lawley. It’s that quality all-round performance that gets Lawley most excited about Bolden’s prospects in the league. "Jonah definitely has the height and the length, the skillset, and the foundation to build on," Lawley said. "His body is becoming a bit more flexible and agile and he’s proving that he can be a factor and that’s something the Sixers have been able to see. "He is such a force on the defensive end especially and can affect the game, and they want to have him in there. "He’s slowly getting more minutes, he’s first off the bench, he’s had a couple of starts under his belt. Before we didn’t know after he was drafted if he would stick or he would just be stashed overseas, so if that doesn’t show what his trajectory looks like, then I don’t know what is." Lawley believes the Australian connection in Philadelphia, with reigning Rookie of the Year Ben Simmons and former NBL coach Brett Brown, will also serve Bolden well. "Having the Aussie network is extremely clutch, not just for familiarity but for longevity and as long as there’s no executive changes, the way their program is right now, I think he can have a great impact and be there a while longer," Lawley said. "He’s hungry and that’s going to help continue fan the fire." While the influx of Australians entering the NBA may be a surprise to some international basketball pundits, Lawley, who has been training players from Down Under in the NBL and NBA for years, says it’s no accident they’re turning heads in the game. Lawley said in his experience training elite players from around the world, there is no doubting the unique characteristics of Australian basketballers, and it’s that quality that has made their rise inevitable. "That AFL and rugby upbringing has a lot to do with the way Australians play and handle themselves on court," Lawley said. "They don’t shy away from contact, they’re brutes when they get on court and have that aggressiveness and intent. This style of play, it’s an intangible characteristic that really makes a difference. "There’s also the IQ perspective. They’re learning without some of the trainers or resources around them, but they figure out ways to teach themselves, and understand the game form a team perspective and that stuff carries over, just look at Joe Ingles - amazing intellect on the court, Ben Simmons - court awareness and vision, so cerebral with the game, and Delly, he can put so much heart into the defensive end and he is still so intelligent on the offensive end. "That is a commonality among every Australian player." At the grassroots level there is room for improvement though, and that’s where Lawley and Randle hope to give Australian kids a boost. Lawley has been working with Randle, the 2017 NBL MVP, for about four years, and counts the American as one of his closest friends. Through their relationship they decided to bring a bit of US-style training to Australian junior basketball, which the pair believe lack a few key elements. "The young kids, they’re so used to running around and having a good time, but they’re not used to someone being fiery and push them to be better," Randle said. "Because we didn’t grow up like that. We grew up coming to the gym and people pushing us to become the best basketball players we could possibly be, so it’s about breaking that and get them to really work hard, be energetic, be positive, show heart, that’s what we try to teach." "It’s that last little piece to the puzzle, because Australia has some of the top talent," Lawley added. "It’s been showcased at the FIBA world level, at the World Cup or Olympics, the Aussies are at the top of the contenders list. There’s a paradigm shift right now in Australian basketball, they’re making their imprint, now it’s just about fusing together that last piece of the puzzle in the development. "In Australia it’s a little shier, a little more of a passive demeanour. The game that they play - physical and aggressive - is amazing, but if the kids can learn to take more of that energy into their daily training routine, it can really go a long way."